"The 17th Michigan Volunteer Infantry Regiment was mustered at the Detroit Barracks in August 1862 under the command of Colonel William H. Withington. The regiment consisted of raw recruits from field, workshop and schoolroom. One company was composed almost entirely of students from Ypsilanti Normal School, now Eastern Michigan University. With less than a month of military training, the 17th left for Washington DC, on August 27, 1862. From there it was sent to the Maryland campaign. On September 14, a little more than two weeks after leaving the state and just three days before the Battle of Antietam, the regiment engaged in battle here." 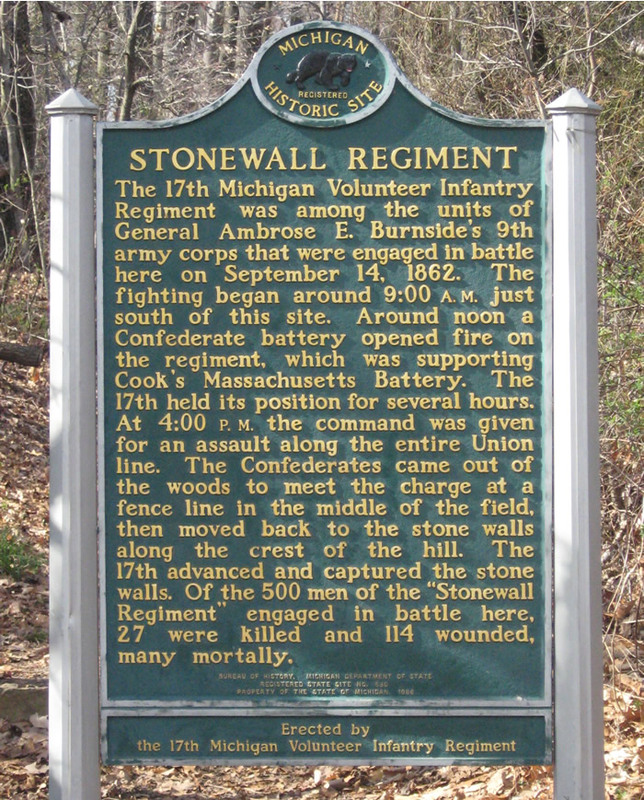 See the 17th Michigan Stonewall Regiment marker on South Mountain from a post on behind AotW.